Whatever Happened to Steak and Champagne in Coach? 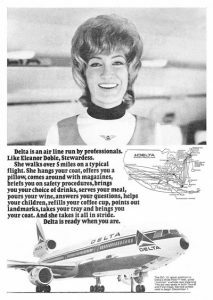 Before the Arline Deregulation Act of 1978, the government was in full control of what the airline industry charged for seats, and which routes they received. The only way for airlines’ to compete against each other, was to offer the best customer service and flying experience they could. As a Delta Airlines flight attendant in the early 70’s, I worked hard for the money. Back in 1972 Delta offered a complimentary filet mignon steak dinner and all-you-can-drink champagne in coach. Business boomed as flyers flocked to Delta for patience, empathy, a man size slab of beef, and bottomless bubbly. I’ll share that nightmare job with you in some other blog post. And trust me, I’m sure I did. 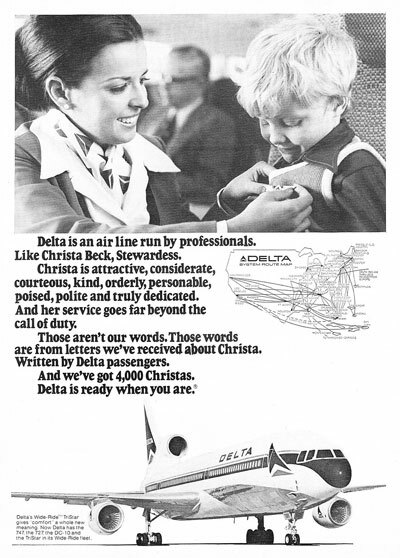 Delta hyped us as attractive, considerate, courteous, kind, orderly, personable, poised, polite, truly dedicated and goes far beyond the call of duty. 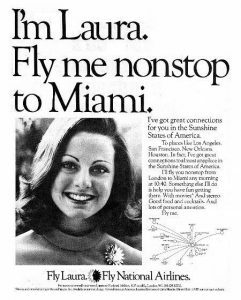 But nothing could beat the sexist “Fly Me” advertising campaign that National Airlines rolled out with just around the same time. 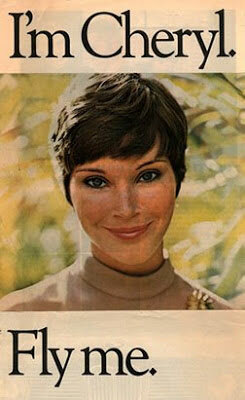 National offered up their modelesque flight attendants as part of the airline travel experience. The company painted the ladies’ first names on every plane and mandated that the attendants wear “Fly Me” buttons during in-flight service. We’ve certainly come a long way from the 70’s. Children with peanut allergies and their families are roughly removed from planes, a young mother who is trying to manage twin babies is hit in the head with a stroller, a 69-year-old man suffers serious injuries after being slammed and dragged off a plane to accommodate an airline employee. And if you’re lucky enough to survive an airline personnel bully, you still have to be jammed into a packed plane, with no leg room and no food. And how about the dreaded reclining seats? I wish the airlines would wake up and make the seats immovable. Why they think there is any available space for reclining is beyond me. It just makes the ride that much more unpleasant. And I hope that passengers continue to record the antics of airline personnel bullies and to stand up and say something if they see something. I don’t expect to dine on steak and champagne in coach, but I’m tired of being treated like a piece of meat. 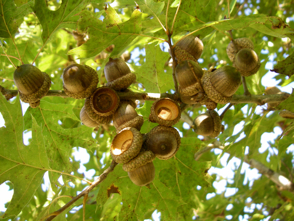 Who knew Oak trees ladened with acorns could result in Lyme disease? In 1969, the first case of Lyme disease in the U.S. was discovered in a grouse hunter from Wisconsin. But the disease didn’t get its name until 1975, when there was an outbreak in children from Lyme, Connecticut. And then in 1982, the bacteria responsible for causing the disease was finally identified. The Pennsylvania Game Commission’s website states that in 2009 95% of reported cases of Lyme disease in the U.S. occurred in the following 12 states: Pennsylvania, New Jersey, New York, Massachusetts, Connecticut, Wisconsin, Maryland, Minnesota, New Hampshire, Delaware, Maine, and Virginia. According to the Cary Institute of Ecosystem Studies, a bumper crop of acorns could be putting the U.S. on the brink of an unprecedented outbreak of Lyme disease. Rick Ostfeld, a disease ecologist at the Cary Institute, estimates that 300,000 Americans are diagnosed with Lyme disease each year, but that the illness is now on track to being the worst in 2017. Because acorns are a critical food for white-footed mice, as acorn production surges, mouse population climbs, giving rise to more disease-carrying ticks. White-tailed deer also feed on acorns. The mice and deer both carry ticks that drop off in the winter. The following year the female ticks lay their eggs and hatch larval ticks. Those larval ticks become infected when they feed on the mice and deer, so the whole process takes about two years. Additionally, the Lyme bacteria has also been found in Eastern chipmunks, short-tailed shrews, coyotes, raccoons, rabbits, and feral cats. Domestic animals including cats, dogs, cattle, and horses can also become infected. The bacteria have also been found in many bird species including but not limited to the ring-necked pheasant, mallard, wild turkey, house wren, song thrush, American robin, gray catbird, song sparrow, and house sparrow. With no Lyme disease vaccine available for humans there is not much that can be done to prevent the illness except for the standard anti-tick measures like head to toe clothing when in the woods and diligent tick-checks. There are Lyme disease vaccines available for pets. Ticks can be as tiny as a pin prick, and easy to miss. Not everyone gets a rash, and flu-like symptoms are easily overlooked and/or misdiagnosed. Bottom line? Stay far away from acorns. The prince contemplated suicide, although in the end he was poisoned by Laertes, and not by his own hand. I have always preferred my own interpretation of Hamlet’s words though: That a sleep full of dreams might help to offset troubles and sufferings in life. A pair of papers was recently published in the journal Science, offering evidence that we sleep to forget some of the things that happen to us each day. Sleep to forget. Maybe that’s all that the heartbroken Hamlet wanted to do, and then, perchance, to dream. I am not a good sleeper. I lay awake each and every night with a million thoughts running in and out of my brain. And when I am lucky enough to catch a break, and fall into a deep sleep, I have some sicko, frightful, extremely detailed dream that never seems to end. Most times I forget them by morning, although when the dreams wake me up in the middle of the night, with my body drenched in sweat, and my heart pounding out of my chest, I recall them all too vividly. And as I lay there shaking in my bed, I analyze what in my life is causing such terrifying phantasms. People have been pondering the meaning of dreams for centuries. Sigmund Freud’s theory centered around the idea that dreaming allows for the sorting through of unresolved events, and/or repressed issues. Sleep to forget. Dream to sort through issues. I recently purchased a book about interpreting dreams. My interest was less about the interpretation and more about Freud’s take on things: Produce a dream based upon a particular issue or event. There was a section in the book that provided instruction on how to provoke a dreaming state of mind. Remarkably, I was successfully able to sleep, and then elicit, not one but five dreams using the techniques from the book. The book first emphasized that unemotional focus was key, and that it may take several nights in a row to produce the dreaming state, although it took me only one. It was also recommended to view any problems or events from a distance. Additionally, the book suggested that if you didn’t have a specific problem or dilemma, but just wanted to look farther into the future, the same process would apply. The most important part of the exercise was not to think too hard or worse, overly obsess about the issue at hand, because that would only thwart sleep, and result in wakefulness. The advice was to analyze the event or problem from an objective point of view and purposefully remove yourself from the issue altogether. The goal was not to try to solve anything, but instead to focus on the issue itself, in the hopes of working through it in your dream state. The bottom line was to specifically focus on what it was you wanted to zero in on before you fell asleep. And most importantly, make sure to keep a pen and paper next to your bed so you can write down all of the elements and particulars about your dream as soon as you awake. Since dreams are mostly fleeting, they need to be written down in as much detail as possible. So that first night, prior to falling asleep, I placed a pen and some paper on my nightstand. Then I tried to remove all thoughts from my mind and as the book instructed, forced myself to totally relax. Next I thought about something that had been bothering me terribly, but I did it without emotion, and didn’t try to solve anything. And I didn’t place any blame or ask myself why it was happening. I merely pinpointed the issue, and then began to analyze some of the aspects of the situation. I first asked myself what the dilemma was about. Then I asked myself how it made me feel, and who was involved. As I organized my thoughts and feelings, I kept pushing and pressing my psyche to gain clarity through slumber. And then I must have fallen asleep. Because I need to protect my situations and events, as well as the people involved, I am going to be somewhat vague about the dreams I had. But I will tell you that there was nothing remotely vague about my dreams that night. And my five dreams were broken up. I had one, and then wrote that one down. I was awake enough to write, and excited at the eliciting of the dream itself. And then I had the second and third together. And once I wrote those down, I fell into a deep sleep, and then came the fourth and then the fifth dreams, which I wrote down, quickly falling asleep in between them. When I awoke the next morning, I was well rested but at first extremely disoriented and groggy. I had all but forgotten the dreams until I read what I had written down, and was stunned that the entire night of dreams shockingly tied in with many of the situations I so desperately needed to sort through. Dream One: There were two calendar dates, one was in March, the other in July. In my dream I was very afraid I would forget them both. One seemed more important than the other, and in the dream I actually analyzed whether there was really only one date that I needed to focus on, but just in case, and to cover any possibility, I needed to remember both. I was obsessed with the dates. Blinding, crazy rain. I needed to get to the beach, to be with a girl. I didn’t know who the girl was, but she was important to me. I knew I shouldn’t drive in such bad weather, but it was imperative that I be with this girl. I kept asking myself that once I got to the girl, how would we be able to sit outside in this violent tempest? I kept asking myself that question over and over again. The wind and rain would make it extremely dangerous to travel, but I felt I had to go, that I needed to go, no matter what. Dream Three: I was standing on a balcony, high up in a building, staring at the churning ocean. There was a path in between the water and the building. A path of sand. A mother and her child were walking toward the building. I didn’t know them but I was nervous that they should get away from the water, get closer to the building. The water was rough, and I was afraid for them. Dream four: I told a loved one (I will call the loved one “X”) that I was going on vacation. X called me on the phone to say that while I was away X was going to have a few friends over. I told X that I didn’t care about the friends coming over but that I needed to trust X and that X needed to be responsible. I told X that X never calls and the last time I saw X was over a year ago. I started to cry and told X I needed to get off the phone. Dream five: A woman got a disease on a ship and a man was sitting next to her and consoling her. He put a blanket on her and set it up like a tent to keep her warm and then sat under it with her. He kept talking to her and reassuring her. Then some boat staff came by and said they had to remove all of the dead bodies. The woman thought she was alive, but they thought she was dead. They poured gasoline everywhere, on suitcases that were strewn all around, and on the deck, as well, and were getting ready to light everything up. As the woman watched, they pulled the man away.